Co-parenting is tough enough without having to wonder if you’re one text away from that phone call from the Highway Patrol. Nobody wants to be the cop in the family even when it makes sense to everybody else. We all abuse the privilege of using the phone while driving so it’s tough being tough on the kids without hearing “you both do it and you’re the only one that gives me grief about it”. Just what you don’t need-playing mom & dad off each other. 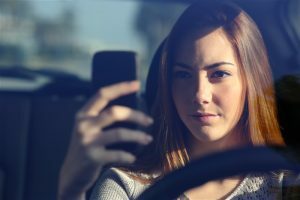 With 400,000 “distracted driving” related injuries recorded in 2015 the (growing) numbers are too much for parents or teens to ignore and teens are four times more likely to be unlucky. There are no easy answers but I keep reading about families that set their own guidelines and act on the “honor system” when driving alone-parents included.